You are here: Home » News » News & Updates » Celebrating Our Apprentices: Peter and Jack! Celebrating Our Apprentices: Peter and Jack! At European Springs, we&apos;re very proud of our team, and we love to celebrate their achievements. So, when our apprentices Peter McClymont (20) and Jack Hever (17) completed their apprenticeships in Performing Engineering Operations, we took the opportunity to give them a proper celebration. Not that we told them about it in advance; for these hard workers it was just another day at our facility until the MP for Beckenham, Colonel Bob Stewart, arrived to present them with their certificates. Pictured above, left to right: Stuart McSheehy, Managing Director, European Springs. Annette Nicholson, Managing Director, Soloman. Peter McClymont, Apprentice, European Springs. Colonel Bob Stewart, MP for Beckenham. Jack Hever, Apprentice, European Springs. Sarah Sutherland, Program Leader, Bromley Education Business Partnership. Janet Miles, Training Co-ordinator, Soloman. Howard Downs, Technical Director, European Springs. The lads were able to undertake their apprenticeship with us thanks to a liaison between the Bromley Education Partnership and Soloman, The Society of London Manufacturers, promoting the placement of apprentices like Peter and Jack with industrial companies like ours. They&apos;ve benefitted from the supervision and expertise of our team, alongside the knowledge of their trainer/assessor from Soloman, Paul Pestell, a former training manager at Ford&apos;s plant in Dagenham. This meant that the entire craft-based apprenticeship framework could be delivered at our plant – the first time that this has been done with an employer in London through Soloman&apos;s scheme. Our surprise guest, Colonel Bob Stewart, is the current MP for Beckenham and a former British Army officer, who served as the first British Commanding Officer for the United Nations in Bosnia from September 1992 to May 1993 and was known by the media of the time as Bosnia Bob. He was charm personified on the day, putting the lads at ease with anecdotes about his life and adventures and chatting about their favourite sports – rugby in Peter&apos;s case, and kick-boxing in Jack&apos;s.
Like us, both of the lads are delighted with their achievements, and Jack&apos;s looking to move on to a higher apprenticeship in September. At European Springs, the expertise of our team ensures that we always deliver high-quality products – from disc springs to compression springs or wire pressings. 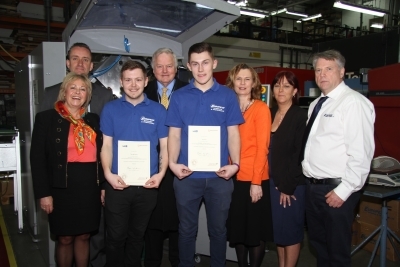 That&apos;s why we are so pleased to support our apprentices and shout about their achievements! For more information, get in touch with us today on +44 (0) 208 663 1800.